Rebecca caught the adventure bug early in life after spending a gap year abroad in Southeast Asia. During her undergraduate career, Rebecca studied Spanish and Education at Colorado College. When not in the classroom, the majority of her time was spent hiking, skiing and camping. Since graduating in 2010, Rebecca has led and facilitated groups in Southeast Asia, Latin America, Africa and most recently, Cuba. She is currently based out of Portland, Maine where she works for a local non-profit that helps schools start Outdoor Adventure Clubs. She continues to promote experiential education and gap year programs abroad. Fun fact... Rebecca has led over 500 people in 10 different countries. She is our certified Vinyasa Yoga Instructor and Wilderness First Responder. She is excited to lead Pacha Adventures and share her passion for the outdoors with other women! Cat's passion for the outdoors grew through living an active lifestyle in her home state of New Hampshire. Growing up near the White Mountains and the Atlantic Ocean allowed her to indulge in a variety of outdoor sports including hiking, skiing, snowboarding and surfing. She has a background in sustainability and currently works as the Sustainability Coordinator at Endicott College in Beverly, MA. She strives to combine her passion for the outdoors with her work in sustainability through leading trips with environmental awareness as a number one priority. She has a BA in Spanish Studies from Colorado College and a M.Ed in Higher Education. Sara is a seasoned outdoor trip leader, educator, and agriculturalist. She graduated from Colorado College alongside Rebecca and Cat as an Asian Studies major with a minor in Music. She’s led 300 mile multi-day backpacking trips in Colorado with teenagers, has taught both inside and outside of the classroom, and runs an edible landscape design business. She lives for adventure and is an avid surfer and hiker. 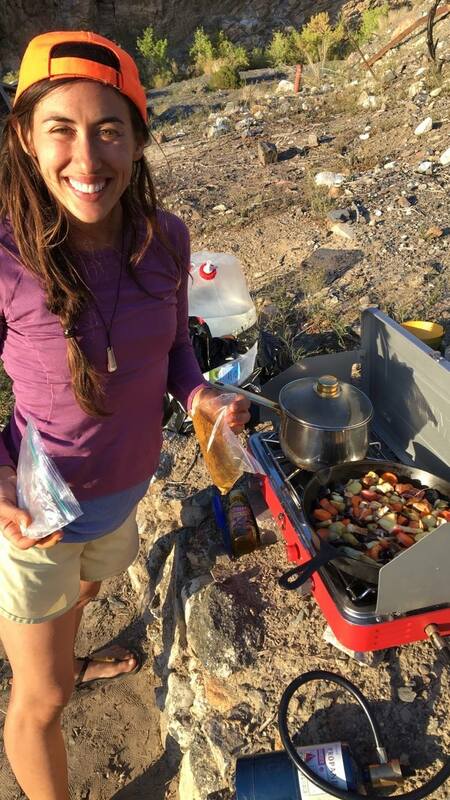 Sara loves to cook nourishing and inspiring kitchen-sink meals, and is backcountry chef at heart. She is excited to inspire and facilitate adventure, personal growth and well being for women through the growing Pacha Adventure tribe.